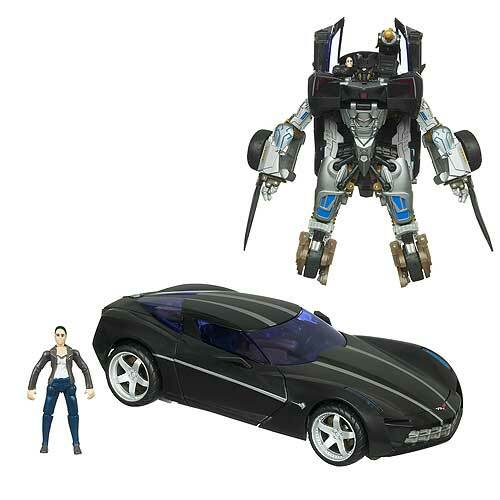 Discussion in 'Transformers News and Rumors' started by Sam Witwicky, Aug 27, 2010. I am really liking the black color and the dark blue widows on him. He kind of has that Knight Rider feel to him too. I'll have to wait when someone either finds him at retail or I see in the store. Plus I'm a pretty big fan of the Human Alliance line and have everything single one that has came out including Mudflap. i wish one of the deluxe sideswipe's had a black head so i could swap it out with swerve for a more g1 look. It looks ok I guess. Completely pointless repaint though. They could have at least done him in blue with flames and made Tracks out of him. Either that or make him red and call him Swerve, or even G1 Sideswipe. Also I notice that he continues to have mistransformed legs in all stock photos. That looks.... terrible. They didn't even bother making the robot bits match. Ok @ best...pointless really....megan fox look like sam with a coat. I'm liking this. If this is the first look it should have been in News/Rumours. I'm liking this too, its actually having me think about possibly purchasing it! Its almost worth it to just get it, and leave it in car mode because wow, thats sleek! And yeah, the new Megs fig looks like Sam with a coat! meh, not impressed. Would love to have seen it in tracks colours. First HA I won't be buying. They're a little too expensive for my tastes to be messing around with repaints. Car looks great, but that car always looks great. That robot's color scheme has some issues though. Nothing I'll be getting (and I'm a fan of the mold- although I hope they take a new pass at him for the next movie). wow Mikaela looks like a man. Is the stomach section meant to be the hood? In which case, why isn't it also black? Lackluster repaint of what is probably the worst mold in the line. Absolute pass for me. Not worth getting in my book. I'm happy with the first HA Sideswipe they came out with, thanks. Why would they redeco what is possibly the worst HA figure in the line? And that human figure looks bad. I like, but only because most of my HA stay in car mode, like alternators. That said, I haven't been able to afford the last three HA released, so probably won't have a chance at this one. also add me to the list who want to see a blue tracks repaint or red Sideswide repaint. And, couldn't that Mikaela come with a new sculpt TF? Sideways, maybe? Sideways, ponytail Mikaela & Elita-1? Say hello to the new shelfwarmer of the HA line. There are STILL silver Sideswipes hanging around the stores. This should have been Mudflap re-released!